More about Santa Lucia, patron saint of Siracusa – a young girl living under Emperor Diocletian (304 CE) who refused to defile her virginity. Giving away her earthly dowry, she was turned in by her pagan betrothed (not happy about the dowry giveaway) and ordered to a brothel by the Roman governor of Ortygia as punishment. Finally the governor had it with her obstinance and ordered her put to death. Miracles ensue: she refused to leave her house and a team of oxen couldn’t drag her away. They tried to burn her at the stake, but somehow the wood wouldn’t light. Clearly, they didn’t get the message, because a third time worked. Finally, she was either beheaded or had her jugular vein pierced – her images show a sword in her neck but head still attached. In a separate story, or a pile-on of the same excruciating martyrdom, she either had her eyes gouged out or gouged them out herself “so that no man would be tempted to look at her.” Hence St. Lucia became the patron saint of the blind, and also migrated north to Lutheran Scandinavia where her saint’s day (Dec 13) was celebrated as the shortest day of the year (in the Gregorian calendar before the switch to Justinian) and is currently celebrated in Sweden by girls dressed in white with red sashes bearing sweet rolls for their parents. 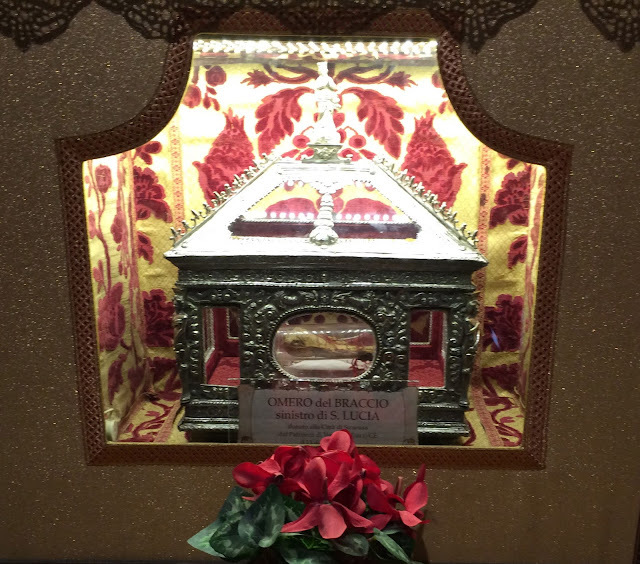 She is also venerated throughout the world as a major martyred virgin (not sure why this is such a blessed thing) with a story of her bones being snatched from Ortygia to Constantinople to Venice by crusaders, and distributed as reliquaries – an arm here, a head there. An arm bone is prominently displayed in the Ortygia Duomo in a magnificent silver reliquary. In 2014 what is believed to be her corpse was on loan to Ortygia from Venice for several weeks – a huge deal. Miracles took place. Madonna Lacrima, our lady of the tears, a church shaped like an upside-down ice cream cone, dominates the skyline of modern Syracusa. You can see it from miles away. It was built on the site of a house where, in 1953, a picture of the Virgin cried tears for 4 days. 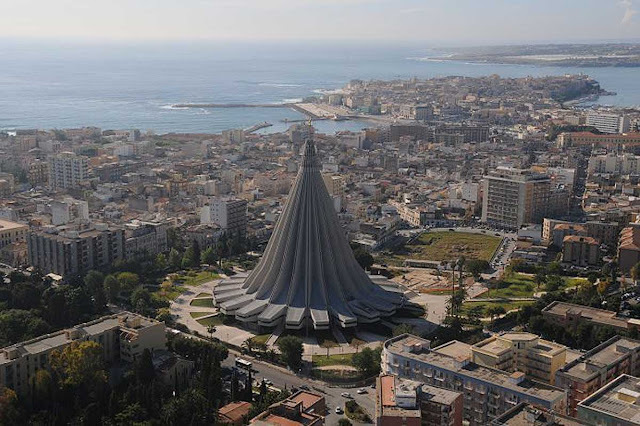 Word spread, crowds of the faithful arrived, the tears were analyzed and determined to be real – or at least chemically related to human tears: the Church declared it a miracle and the tear-shaped cathedral of Madonna of the Tears was built on that spot, dedicated in 1994. In a corner of the world where convex, curved, and curliqued baroque churches prevail and delight, this is an eyesore. 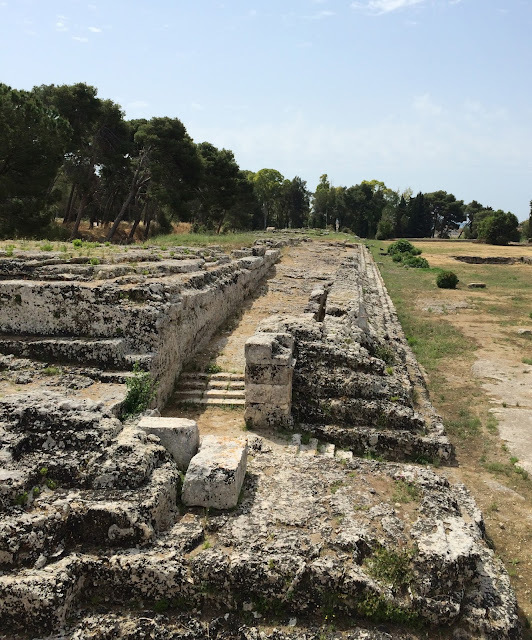 The archeological park in Syracuse, one of the must-sees of the town, is a disappointment. I am embarrassed to admit that I am jaded by the vast sites of ancient Egypt and some of the spectacular Roman sites of the Middle East – Jerash in Jordan and Baalbek in the Bekaa valley, not to mention Pont du Gard and the arenas of Arles and Nimes in Provence. BUT the park does have the remant of the largest known sacrificial Greek altar in the ancient world used once a year for a feast of slaughtering 100 bulls. (Try to imagine the chaos and gore). Gazing out at the stone encarpment 100 meters long I am reminded of the prominent and ghastly feature of sacrifice in all ancient religions, including ancient Israel – which Jews today hardly recognize as relevant to contemporary Judaism. It’s astounding that Jews have managed to build on the past, adapt to the present and move in to the future, taking the best with them, leaving the worst behind. 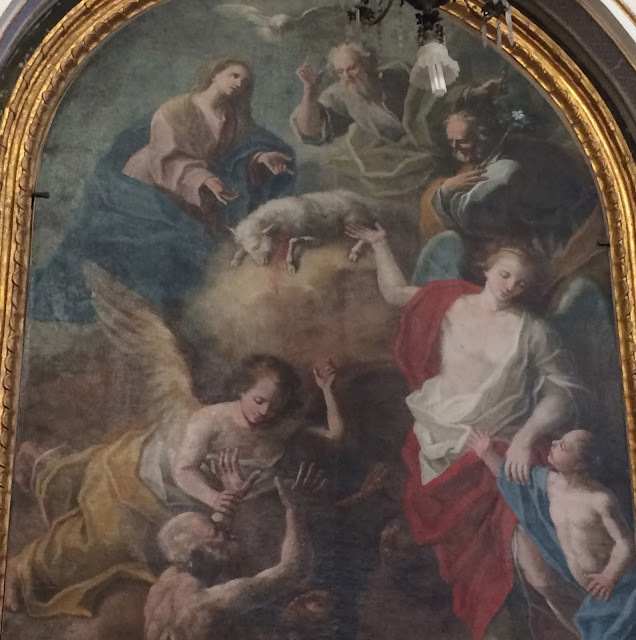 It occurs to me that Catholicism and its emphasis on Jesus as sacrifice, the altar as sacrificial table on which the wine and wafer are offered and turned to blood and flesh, makes perfect sense as the direct heir to temple Judaism (ending in 72CE with the destruction of the Second Temple) and the centrality of blood sacrifice. Blood sacrifice, which Jews today find unrecognizable, is taken up by the imagery of the Roman Catholic Church with its bloodied martyrs, and endless blood symbolism. Ironically it may be the most direct link back to ancient temple Israelite practice. 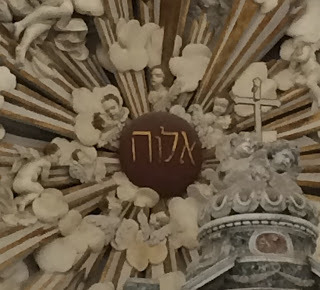 More ecclesiastical peculiarities: In two churches in Noto, we find prominently featured above the altar and central crucifix (very bloody, always) the words in Hebrew “Adonai” and “Elohim” – or something that looks close. 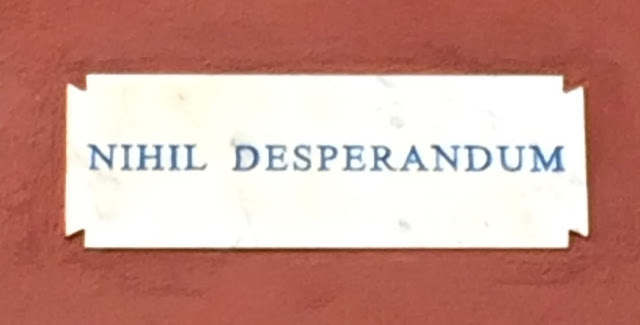 No explanation in any guidebook. 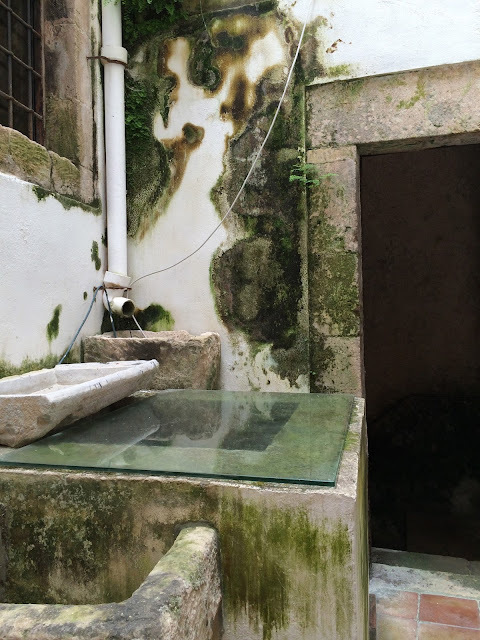 The Guidecca in Ortgyia, (Jewish quarter of the island until 1492 when Spanish- controlled Sicily forced the expulsion of its Jews) has almost no vestige of Jewish heritage (perhaps in the people themselves of whom 25% were Jews at one time) except for the discovery of what was most likely a mikvah several stories underground in the building of a hotel called, fittingly, The Guidecca hotel. For a few euros you can disturb the clientele and walk the 57 damp steps down to the rock bottom to see (no pictures) the three mikvot with their steps down into the very clear green water. Two side rooms offer private mikvot. There are natural springs into the island and the water runs in and out. Below is a picture of the courtyard source of some of the water, 5 floors above. The only other remnant we see is in a ruined church to San Giovanni Baptista in the Guidecca, which may have once been a synagogue. 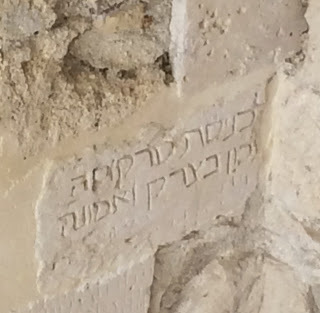 A stone with Hebrew inscription has been used in the rebuilding, placed upside down. The cheerful artisan who works (and lives?) in the ruined church is building a chair for a priest who will preside at a wedding in the roof-less church. 500+ years after the explusion, some Jewish tourists but no Jews. The story of Europa. 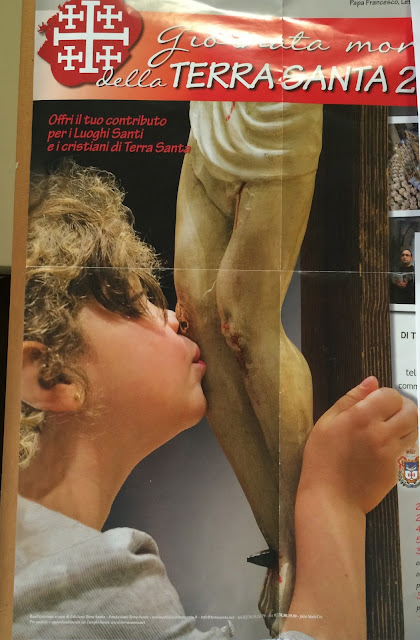 A poster in a church in Scicli. Enough said. The lamb of God, bleeding. Sacrifice? 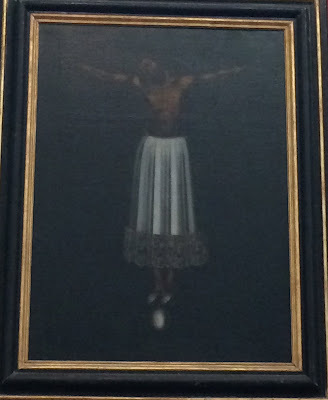 A rare example of Spanish influence: Christ wearing a white skirt on the cross.